Order your own copy of The Ghost of Framsburg at your local retailer or online through our website today! To kill a Dragon, you need a weapon that is capable of the deed. After battling Dagnir to a stalemate at Hrogar’s Hill, it is clear that your weapons are not sufficient to slay the beast. So you have set off for the ruins of the once-great city of Framsburg, where it is said Wormsbane, the legendary sword of Fram son of Frumgar, lies entombed with its master. You hope that this enchanted blade will be enough to conquer Dagnir and leave Wilderland at peace. 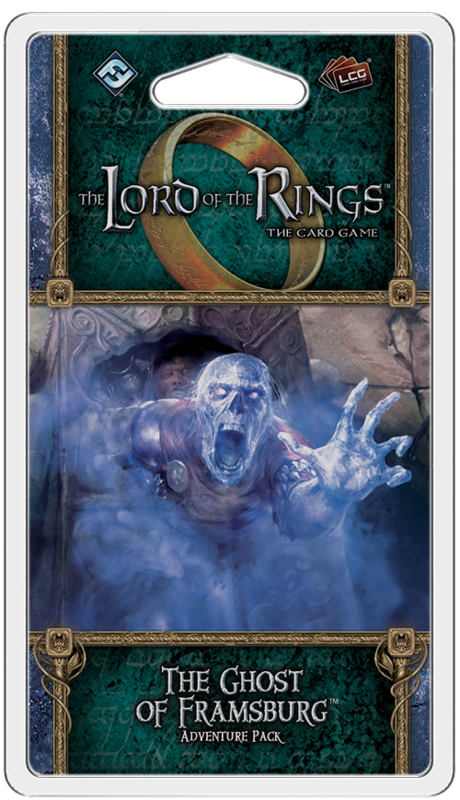 Fantasy Flight Games is happy to announce The Ghost of Framsburg, the fourth Adventure Pack in the Ered Mithrin cycle for The Lord of the Rings: The Card Game! In order to find Fram’s legendary sword, this Adventure Pack beckons you inside Framsburg’s haunted keep, where unseen dangers lurk around every corner. Compared to the chaos of your battle with Dagnir at Hrogar’s Hill, these halls appear quiet and serene. Yet an air of forboding grips your party as night falls over the city. Your hands rest anxiously on your weapons and your eyes dart back and forth, as if expecting some sudden assault. This anxiety only increases as you move deeper into the keep. Fram’s sword has been hidden for countless centuries, and his tomb has been lost to the ages. 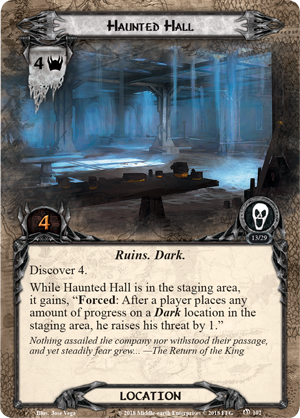 Worse yet, the keep’s interior is a maze of Forgotten Crypts (The Ghost of Framsburg, 101) and Haunted Halls (The Ghost of Framsburg, 102), prowled by all manner of foul creatures. You would do well to find Fram’s sword and escape quickly, lest you lose yourself to the darkness of these halls forever. But unlike many of your other adventures, your path through Framsburg is not a straight path that can be walked by adding progress to the current quest. 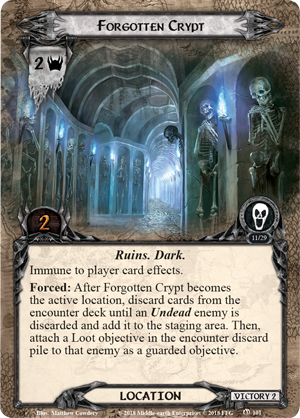 Instead, these secrets lie buried in the encounter deck, waiting for you to find them by exploring with the Discover keyword found on The Ghost of Framsburg’s location cards. 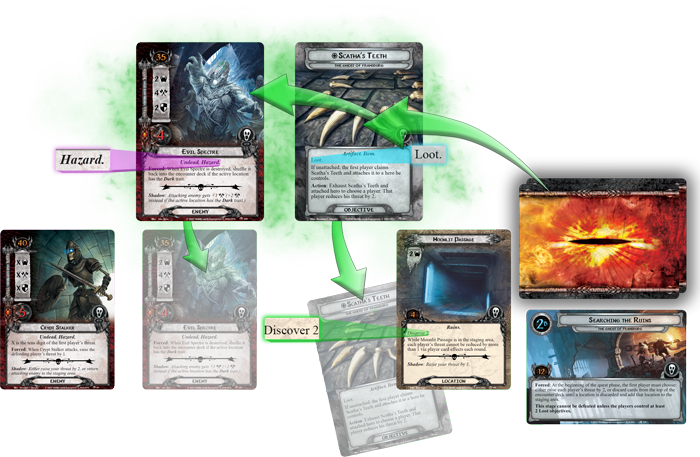 When a card with the Discover keyword becomes the active location, the first player looks at a number of cards from the encounter deck, sorting them based on their traits. Moonlit Passage becomes the active location. It has a Discover value of two, so two cards are revealed from the encounter deck. As a piece of Loot, Scatha's Teeth are attached to Moonlit Passage as a guarded objective. The Evil Spectre, meanwhile, is a Hazard and is added to the staging area. With any luck, you’ll find some valuable Loot cards that will be attached to the active location. 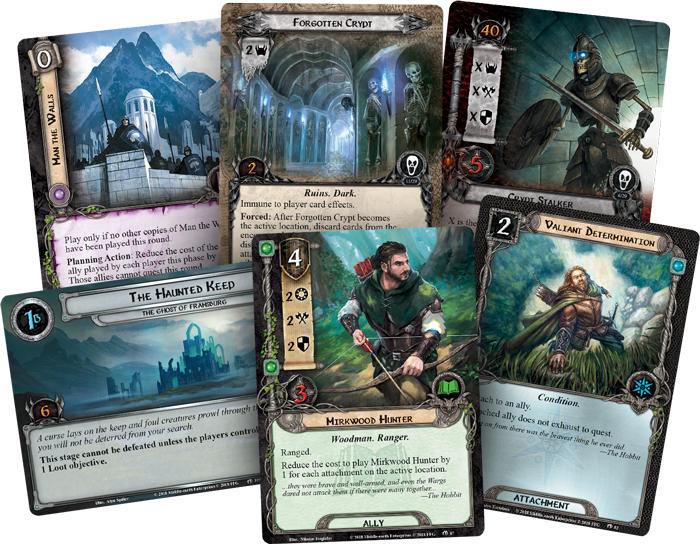 In addition to helping you advance toward the end of your quest, these cards are also valuable treasures that can help you in other ways. 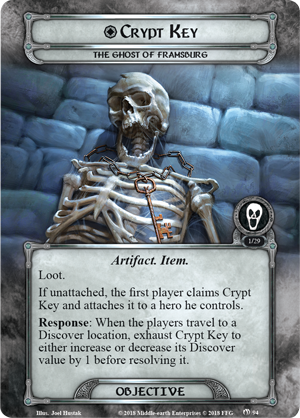 Obtaining the Crypt Key (The Ghost of Framsburg, 94), for example, allows you to adjust the Discover value of a location, giving you much more control over the number of cards that you will reveal! Increasing a location's discover value could lead you to Loot more quickly, bringing you one step closer to finding Fram and his sword. 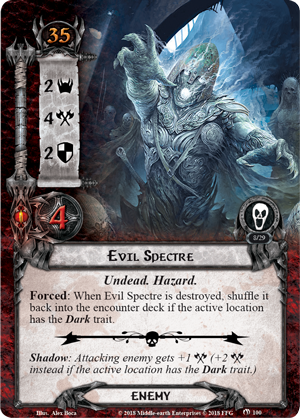 But disturbing the memories of those long past could also draw their ire, and you’re even more likely to come across cards bearing the Hazard trait, such as an Evil Spectre (The Ghost of Framsburg, 100). If one or more of these Hazard cards are revealed during your discoveries, one of them is randomly selected to become another obstacle in the staging area. With the night deepening and your sense of dread growing with every passing hour you spend in the keep, it would be easy to give up on your quest and seek another way to slay Dagnir. 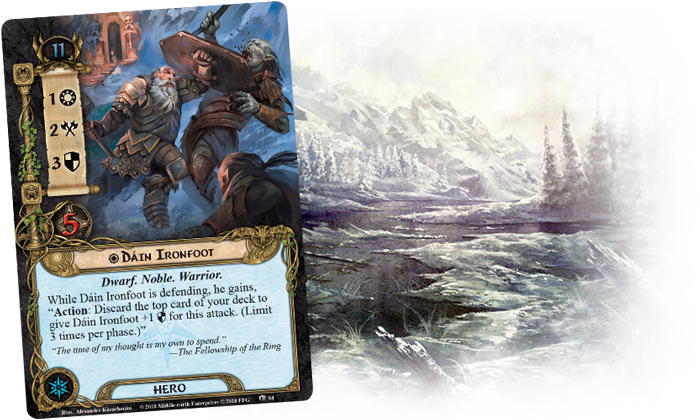 Fortunately, The Ghost of Framsburg provides you with plenty of powerful player cards that can help you see this task through to the end, beginning with a new version of the King Under the Mountain himself, Dáin Ironfoot (The Ghost of Framsburg, 84). Determined to reclaim the Dwarven treasures found in Framsburg, Dáin possesses the courage to lead your company all the way to Fram’s tomb. 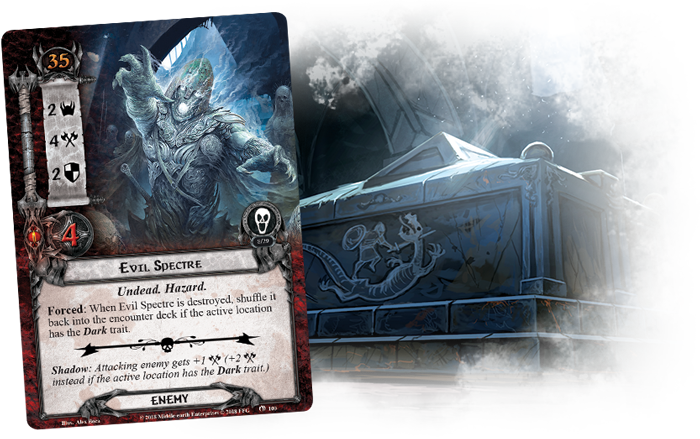 Already a strong defensive hero, you can discard the top card of your deck to boost Dáin's defense, saving your other heroes and allies from the punishment they’ll inevitably take in the tombs and catacombs of Framsburg. 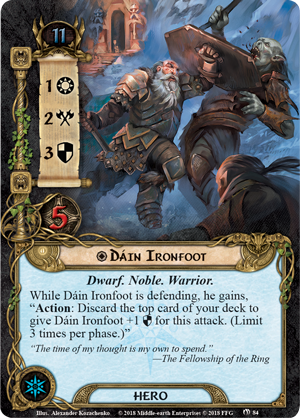 Dáin may be naturally suited to defending against enemy attacks, but that's not the only contribution he can make to your party. Sometimes the best defense is a good offense, and if you equip a Warrior character like Dáin or a Tactics character with a Warrior Sword (The Ghost of Framsburg, 89), he can free your companions to perform other tasks by drawing enemies to himself. 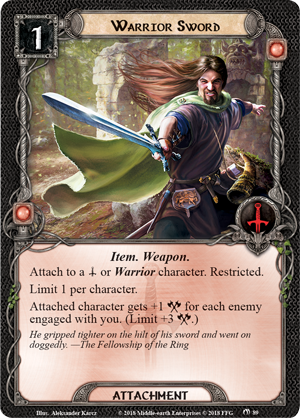 The Warrior Sword boosts your character’s attack for each enemy engaged with you, potentially bringing giving Dáin a total of five attack strength—more than enough to deal some massive damage. 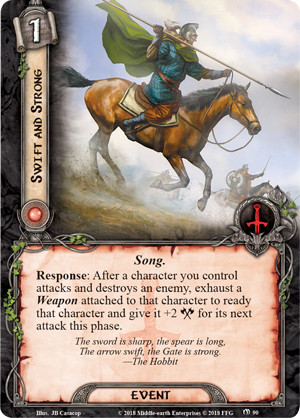 If handling so many enemies at once gives you pause, Dáin can defeat these enemies almost as quickly as he engages them if you play Swift and Strong (The Ghost of Framsburg, 90). By playing this event and exhausting the Warrior Sword, you can immediately ready Dáin after he attacks and destroys an enemy. Destroying an enemy may have tempered the Warrior Sword’s strength a bit, but Swift and Strong more than makes up for this by giving your character two additional attack strength for his next attack. Far underneath the haunted keep, the darkness grows. Somewhere in the distance the sound of fell creatures emerges from the inescapable gloom. Despite your dread, the sword you seek lies somewhere in these labyrinthine halls. Steel your nerves, muster your courage, and you will find the strength to slay Dragons! Look for this Adventure Pack in the first quarter of 2019 and pre-order your copy of The Ghost of Framsburg (MEC69) at your local retailer or online through the Fantasy Flight Games website here!